﻿ Psalm 2:7 "I will surely tell of the decree of the LORD: He said to Me, 'You are My Son, Today I have begotten You. I will declare the Lord's decree: He said to Me, "You are My Son; today I have become Your Father. Let me announce the decree of the LORD that he told me: "You are my son, today I have become your father. I will tell of the decree. LORD said to me, Thou are my son, this day I have begotten thee. I will make clear the Lord's decision: he has said to me, You are my son, this day have I given you being. I will declare the decree: Jehovah hath said unto me, Thou art my Son; I this day have begotten thee. I will declare the decree; the LORD hath said unto me, Thou art my Son; this day I have begotten thee. I will recount for a law of Jehovah: He said to me, Thou my son; this day I begat thee. 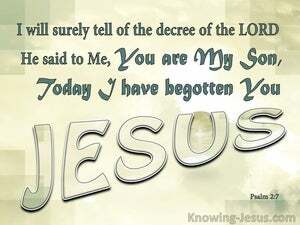 I will declare the decree: the LORD has said unto me, You are my Son; this day have I begotten you. I will tell the decree; Yahweh said to me: "You are my son; today I have begotten you. I will declare the decree of Jehovah. 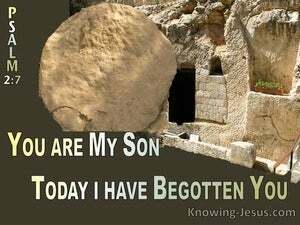 He has said to Me, You are My Son; today I have begotten You. As for me, I will preach the law, whereof the LORD hath said unto me, "Thou art my son, this day have I begotten thee. The king says, "I will announce the Lord's decree. He said to me: 'You are my son! This very day I have become your father! I will tell of the decree. The LORD said to me, "You are my son. Today I have become your father. I will declare the decree: the LORD hath said to me, Thou art my Son; this day have I begotten thee. 6 "But as for Me, I have installed My King Upon Zion, My holy mountain." 7 "I will surely tell of the decree of the LORD: He said to Me, 'You are My Son, Today I have begotten You. 8 'Ask of Me, and I will surely give the nations as Your inheritance, And the very ends of the earth as Your possession. He has also established them forever and ever; He has made a decree which will not pass away.